I cannot remember where I saw this game first. It may have been in a Youtube video somewhere, but I was interested by it and bought in on the Google Play store. I played it for a while, but I didn’t think much of it. I found it difficult at the time and I put it on the shelf for a while. I recently picked it up on Steam after a friend gave me a key on a forum for the game. Upon playing it on the PC, I realized how good the game really is. 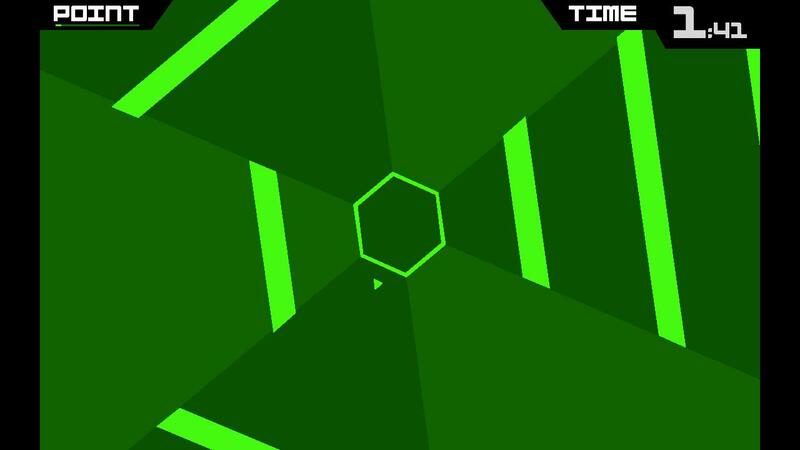 On Android, I traditionally have the sound muted, so I didn’t hear the retro/ spacy music Super Hexagon had to offer. Plus I didn’t really like the controls on the Android. I felt that touch feature was inconsistent in the game. Upon playing it on the PC, it felt like a completely different game. It is a very straight forward game where you are a triangle that is stuck in a hexagon with walls coming at you at each of the six sides of the hexagon. The game speeds up and gets faster as the player progresses through the patterns and colors. What makes the game so difficult is that the colors throw off the player. They are bright and neon like, which can cause the player to observe the colors more than the walls progressing at the player. Another factor is the fact that game spins which makes the game harder to follow. An enticing factor for the game is the simplicity of it. There is no aiming a sniper scope in between two barrels to kill someone or slaying a bronze dragon with a bow. It’s simplicity makes the user want to play more, to progress more and beat their old records. It is a super fun game and I recommend it to anyone who wants to kill a couple of minutes or a complete hour. It has a huge replay value and is very addictive. Although there are only six levels, they retain good replay value because the patterns of the walls always change and the colors add a cool dimension to it as well.It is overall a fantastic game and it is well worth the purchase.